Foodblogging looks like the latest hot topic doing the media rounds. And too right, for what could be more newsworthy than food? 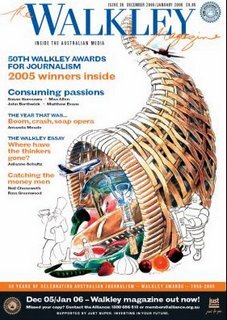 Grab Your Fork scores in a mention in the latest edition of The Walkley Magazine, the media industry mag produced by the Media, Entertainment and Arts Alliance of Australia. The bulk of the article centres on interviews with Anthony from Spiceblog and Sean from Sydney Food Diary, who discuss their own blogs and motives against the growth of foodblogs in Australia in general. Another Sydney-based food blog that already provides some coverage in these areas, as well as restaurant reviews, is Grab Your Fork http://grabyourfork.blogspot.com/). Like Sydney Food Diary, this site also has heaps of photos of plates of food. You can't help thinking that the waiters must wonder what is going on with these people. I like to think they smile with amused resignation as the geek on table three takes infinite shots of the meal they've just delivered. Congratulations AGAIN! Very well deserved. You go grrrl!~ And have a great time in NY - try and fit in some Cuban Chinese food - it's really strange but good. Excellento! Congratulations on this wonderful mention. Now we shall wait for your appearance in AGT! Hi Reid - Tnanks =) When it rains, it pours right? Hi Saffron - Thanks, and yes, I'm looking forward to seeing the article too! Hi Trevor - Next time definitely! I will have to check my emails more often! Thanks for the link and thanks for all your efforts in publicising Australian foodbloggers.